Boss Hoss Cycles, Inc. was established in 1990 when Monte Warne, the founder of Boss Hoss Cycles, Inc., created his first Chevy V-8 powered motorcycle in his 5000 square foot shop in Dyersburg, TN. Monte, a commercial aircraft pilot and degreed Aviation Airframe and Power plant technician, was the first to design a V-8 powered motorcycle that has a traditional cruiser motorcycle style, look and feel. This was accomplished by his unique approach to the motorcycles single speed (one gear) transmission design. The right angle drive transmission allows the length of the bike to be kept to a minimum and the engine-mounting inline with the frame made for a well-balanced design that is unequaled by any other V-8 powered motorcycles. 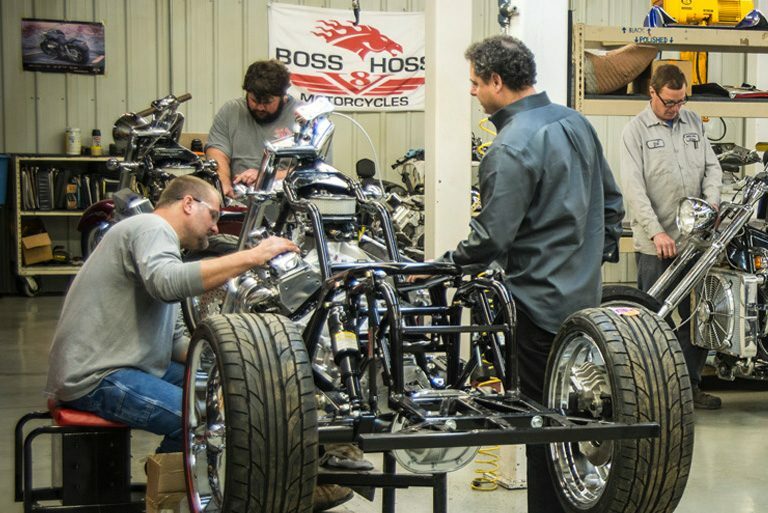 Over the past 28 years Boss Hoss Cycles, Inc. has grown from its humble beginnings in Monte’s shop to a 22,000 square foot manufacturing facility. The product line has also grown from the conventional two-wheeled motorcycle to include three wheeled vehicles commonly referred to as trikes. The product has seen significant improvements over the years through the R&D efforts of Boss Hoss Cycles’ in house engineering personnel and specialty contractors. Features like a 2-speed transmission with reverse, inverted front suspension, vacuum formed body panels, investment, cast structural frame components, and many other specially designed components have helped improve the rigidity and ride of the Boss Hoss motorcycles. Boss Hoss has continued to broaden and expand the V8 motorcycling horizons. In January of 2006 Boss Hoss motorcycles and manufacturing facility received full vehicle type-approval from the European Commission (EC), effectively making Boss Hoss Cycles, Inc. the only globally approved V8 motorcycle manufacturer. At the release of the 2012 model trikes with 4L70E overdrive transmissions and air ride suspension as standard production, Boss Hoss once again put the motorcycling world on its toes with the introduction of the new Boss Hoss Super Sport model. The Super Sport is the first new model design by Boss Hoss since the release of the 502 model in 2000. The lower seat height, shorter wheelbase and increased suspension travel, makes it feel like you’re part of the Super Sport… not just on it. This latest creation from Boss Hoss was designed to attract a wider range of motorcycle enthusiasts. In the true innovative spirit that brought the Boss Hoss to life, these dream machines will continue to astonish the most diehard motorcyclist. 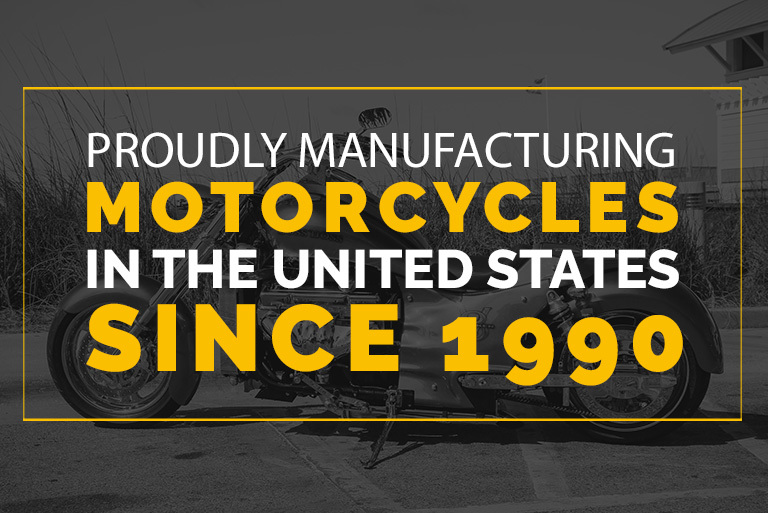 Proudly ‘Made in the U.S.A.’, Boss Hoss Cycles, Inc. is located in Northwest Tennessee. Our manufacturing plant, office and warehouse facilities encompass 22,000 square feet on seven acres at 790 South Main Street in Dyersburg, TN. If you’re ever in the area stop in and check us out, whether it is just a quick stop by the showroom featuring cycles and apparel, or a pre-scheduled tour encompassing our entire manufacturing facility. From the size of our facility to the number of dedicated employees on staff, you can see first hand that the Boss Hoss is manufactured in a clean, streamlined facility where its crafters take great pride in the products they produce. If you’re not in the area you can always check us out in our VIRTUAL TOUR. The foundation of every Boss Hoss is the 1.5 inch, 0.95 wall, 4130 chrome-molly tubing and investment cast heat-treated 4130 alloy neck (yoke) that make up the frame. Every cut, bend and weld in the construction of the Boss Hoss frame is done by ANSI/AWS certified welders at our facility. Our Fabrication Department also re-manufactures the Ford 7.5 inch differential housing that we utilize on all our trikes. We use new high quality performance axles, ring and pinion gears, pinion flanges, brake assemblies, bearings, races and seals. The only component that is not new is the actual rear-end differential housing itself. Every assembly that we weld is placed in a custom jig fixture designed and built at this facility. This allows us to maintain a high level of control over the quality and integrity of our in-house fabricated components. All metal fabricated frames and components are then painted black. We utilize a powder coating paint system that produces a durable, high quality finish that is superior to conventional liquid paint. Virtually every major component that is not produced by our staff is custom designed and fabricated by experts in that given field exclusively for the Boss Hoss. All the component parts that are purchased from our suppliers are sub-assembled and tested in our Sub-Assembly Department. The proven components are then stocked for the Final Assemblers. The Final Assembly Department is where it all comes together. The factory new General Motors engines and custom built proprietary 2-speed semi-automatic transmissions with reverse for the bikes, or in the case of the trikes a modified and remanufactured 4L70E 4-speed overdrive automatic transmission with reverse are mated together. After the union of the engine and transmission, the U.S. Patented Boss Hoss frame is wrapped around the drivetrain assembly by splitting the two piece designed frame. This allows the Boss Hoss to maintain a compact design, which contributes to the bikes amazing light feel off the stand and nimble cornering characteristics. 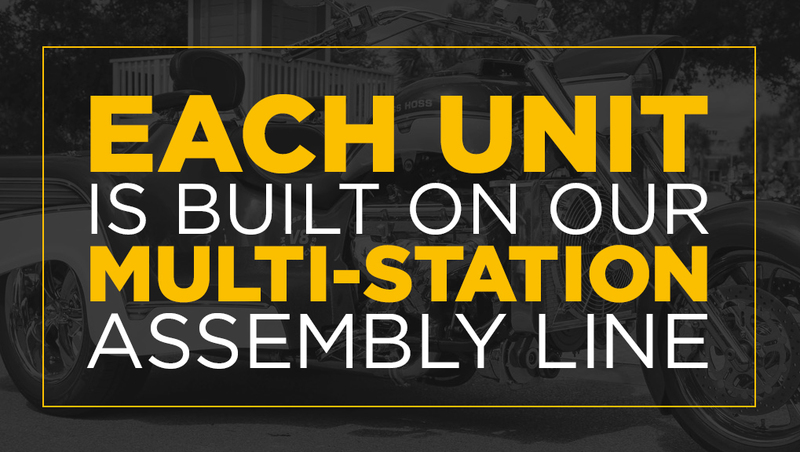 Each unit is built on our multi-station assembly line that allows experienced assemblers to construct and document every stage of the assembly process. No Boss Hoss is complete without being test run to our quality and performance specs.